Cross Stitch Happy: I'm Soooo Excited!!! 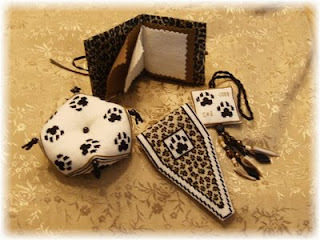 The first entry for the Cheetah Needlework Set Drawing has arrived and it's a beauty!! 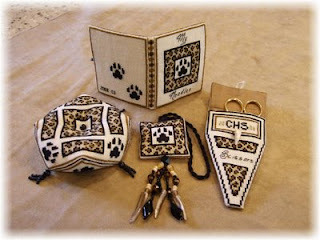 Candace S. did an outstanding job on the whole set - beautifully stitched, expertly finished and very artistically embellished! Look at those details she added on the spine of the needle case! Thanks so much, Candace, for making my simple design look like a million bucks!! She really did a great job on finishing this set!!!! WOW! WOW! WOW! The whole set is so gorgeous! WOWZERS...I think that's the winner...how can anyone live up to that?! GORGEOUS! WOW! That looks absolutely gorgeos! What a great job! Love it!!! 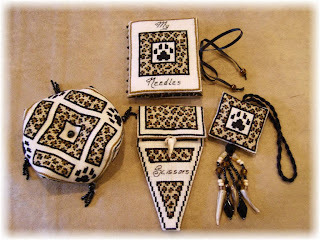 Sharon, I need to stitch your cheetah set!!!. Congrats Candace for a wonderful job!!! WOW is right!! She did an incredibly beautiful job on these! Candace, I wanna be like you!!! Fantabulous! Awww... I wanted to be first! LOL! finished stitching the biscornu, the scissor fob, the scissor case, front and back (whole stitches) and started the needlebook! can't wait to see mine finished! Great job Candace! love how you finished the biscornu with tassels! good job! VERY pretty but your designs, it's not that hard! :-) You make it easy for us. wow!! its awesome!!! what an amazing set to have stitched !! Wow... that looks amazing!!! I think I need to bump that project up on my "to do" list!!! It looks stunning. Great job. These are beautiful - I went & downloaded them all. Thanks! yes indeed what a nice job you have done. WoW! Fab job Candice! Congrats on the finish!!! Wow, that is awesome...great job!